In June 1998, Microsoft released Windows 98. It would become one of the most popular computer operating systems in the world. Google was founded in 1998, President Bill Clinton was impeached for perjury and obstruction of justice, and a gallon of gas cost $1.15. Ford completely redesigned the F-150 for 1997 so 1998 only saw minor changes. 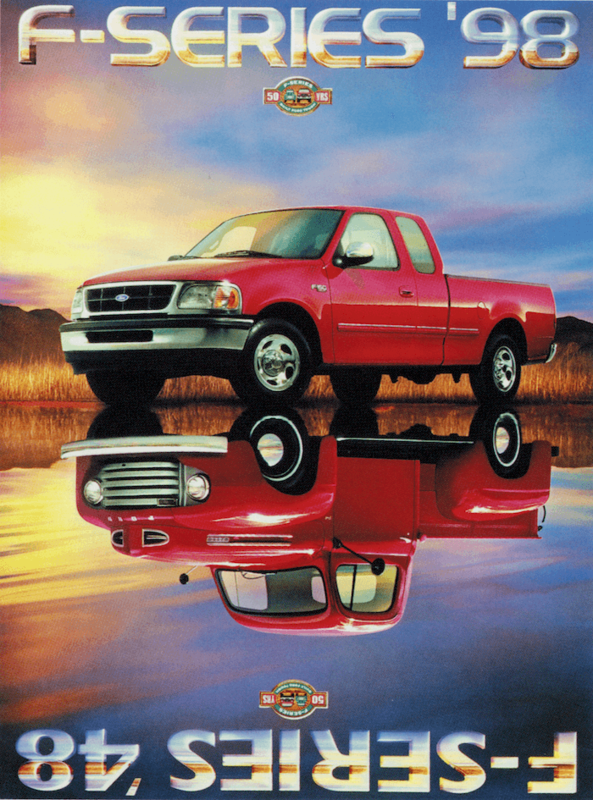 However, 1998 was a big year for Ford trucks, because it marked the 50th anniversary of F-Series trucks. The F-150 was the best selling vehicle in the US so Ford wasn't about to fix something that wasn't broken. So for 1998 there are only a few things different from the year before. The 1997 SuperCab rear side window glass had a metallic like tint to it, whereas the 1998 SuperCab side rear glass had a black appearance to it. A bi-fuel engine prep package became available. It enabled switchover from gasoline to propane or natural gas. 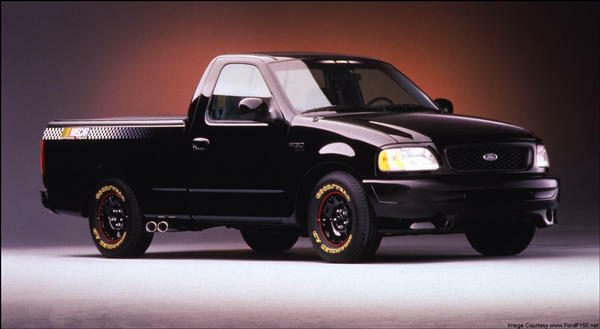 1999 F-150's saw a bigger appearance change, notably in the front end. 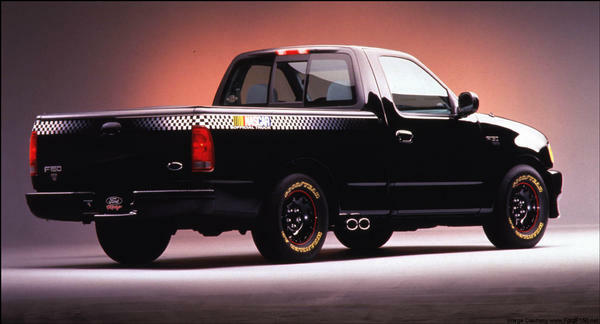 1998 saw the release of a very limited edition NASCAR branded F-150. The NASCAR edition was black with special decals, and only 3,000 were made. This truck happened because Ford became (sponsored) the official truck of NASCAR. They were all short box, regular cab, two wheel drive trucks. The only option was your choice of either an automatic or manual transmission as far as we can tell. It was available in the southeastern US. For more details on this very unique truck including an exclusive interview with Ford, go to NASCAR F-150 page. Here's a copy of the poster that was in Ford dealerships in 1998. The available trim levels were a carry-over from the year before. The choices for F-150 or F-250 were Standard, XL, XLT, or Lariat. The F-250 light duty body for '98 is based on the F-150 body, that will change in '99. The engines and transmission choices for 98 are the same as 97, for the F-150. The 4.2L V6 engine makes 205 horsepower @ 4,750 rpm and 255 lb-ft of torque at 3,000 rpm. The smaller V8 the 4.6L produces 220 hp @ 4,500 rpm and 290 lb-ft torque @ 3,250 rpm. The big V8 engine for the F-150 the 5.4L Triton makes 235 hp @ 4,250 rpm and 330 lb-ft of torque @ 3,000 rpm. A couple decades later we can look back and see that the 4.2L had some issues with head gaskets. The V8's had some issues with spark plugs ejecting themselves from the head, but otherwise the Triton engines proved to be quite reliable engines. Especially compared to the newer 3 valve engines in the next generation trucks (2004+). Interior trim colors for 1998 include Cordovan (a very dark red/burgundy), Willow Green, Medium Graphite, and Prairie Tan.